We are on your side, tenants! 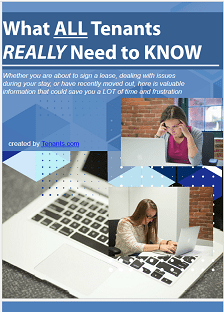 Get the information you NEED to KNOW as a tenant! Moving into a new rental is full of fun, but you probably have lots of questions! How do I request repairs? What if my roommate moves out? What can I do if my neighbor is too noisy? These are things all tenants really need to know. You might have questions when you are even considering moving into a new rental home or apartment. How can I qualify for a rental? Do I need an attorney? Will I need a co-signer on my lease? Even after you move out of your apartment or rental home, there might be issues that need to be resolved. You might need to know how you can get your security deposit back or what will be expected of you from your landlord. And in the case of eviction, you will have many questions as to the right way to proceed. These are great questions to ask and Tenants.com has the answers. Here is how to get your free eBook! We know that you will find this book very helpful. Also we want you to use our free services when you need anything tenant related. Just enter the info above and look in your email inbox for a link to the book. Thanks for visiting Tenants.com!